You can track Google Analytics pageviews on any URL you manage via Google Analytics. You must have a Google Analytics account, and you must connect it to your PlanIT via Settings. Step One: Connect Google Analytics to your PlanIT. 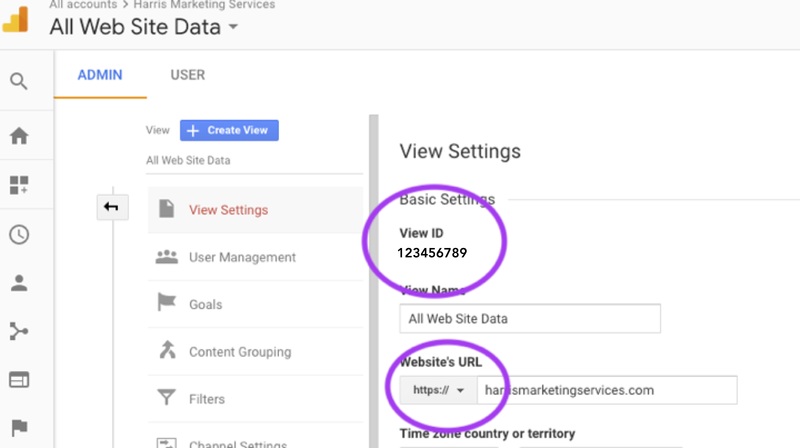 Fin your Google Analytics View ID by going to your Google Analytics account and clicking on the Admin wheel in the lower left hand of the nav bar. Make sure that the URL for the view is the same as the URL you are tracking (http:// vs. https:// ; with or without the www.) Copy the View ID. Hint: make sure that you have created your PlanIT using the same email address that you have used to create your Google Analytics account. Return to PlanITPDQ and click on the Settings gear in the upper right hand of the PlanITPDQ navigation bar. Scroll down to Integrations, select Google Analytics, and enter your View ID as a default setting. Create a new project, or edit an existing one. Choose a start and end date of when you want to start tracking the page views; by clicking TODAY in the end date, your PlanIT will automatically refresh to the current date to give you up-to-the-minute counts. Grab the URL from the webpage that you want to track, and copy the slug following the last slash and enter it in the URL field. When you return to the Project page, click on the blue Save button. To track your stats, simply click on the project from your main PlanIT timeline to see the Pageview stats. That’s it! Easy!